Source: (Citylab.com). “Invented in the 1950s by Malcom McLean, whose adage held, “a ship earns money only when she’s at sea..”Shipping containers offered an increase to the speed at which he could load and unload a ship. As a result, McLean made the whole process more profitable.” Today, shipping containers are having a new renaissance and in a completely different way. With housing prices continuing to climb in North America and England, renters and potential homeowners are looking high and low for cheap and reliable housing. In a wave of ‘brand authenticity’, people are looking for places to live that appeal to that sense of things being made to last and having multiple purposes. As well as having that authentic worn in feel that simply cannot be replicated. In Bristol, England container houses are becoming more prevalent with many young adults drawn in by the sense of community as well as the aesthetic appeal. In a place like Bristol, a city rich with maritime history, the containers act as a way to renew the spirit of the city where gentrification has become more common and threatens age-old traditions. 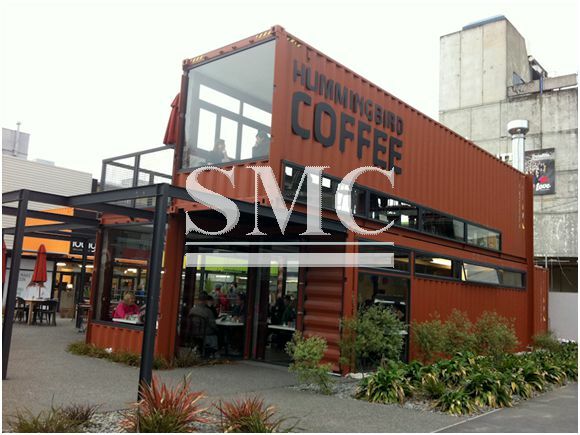 Even small shops selling coffee or some kind of snacks are feeding off the trend and are setting up shop in shipping containers. In these cases, the containers are seen as more of a branding device than anything else, attempting to get that unique feel that can only come from being inside a container. In the year 2000, “architects Ada Tolla and Giuseppe Lignano went to the United Nations to discuss the possibility of using shipping containers as emergency shelters.“Right away the response was that there is a stigma connected to the container, to trailers, and to cheap, quick solutions,” Tolla says. “They said that ‘you need to make it happen in the first world before you can propose it seriously.’” I think it may be safe to say that time has now come. With many developed countries building thriving communities with shipping containers. The possibilities are now endless for these products; from shipping goods to opening your own coffee shop. Shipping containers provide a simple and reliable structure that provokes a sense of comfort and authenticity.